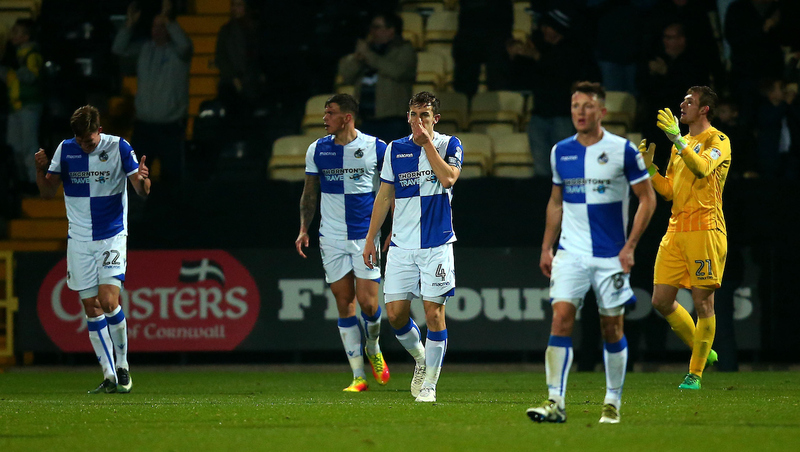 Rovers exit the Emirates FA Cup with a defeat at Notts County. Four headed goals in the first-half led to an entertaining and dramatic evening of FA Cup action at Meadow Lane. Liam Sercombe headed Rovers ahead inside the opening ten minutes, as Rovers doubled their advantage courtesy of Stuart Sinclair shortly later. The hosts forced their way back into the tie with a quickfire brace from Ryan Yates, who twice converted from deliveries into the Rovers box from Carl Dickinson, netting a brace inside three minutes to pull Notts County back level. Notts County took the lead just before the hour mark, as Jon Stead poked home a Jorge Grant cross from close-range, as Grant grabbed himself a goal deep in injury time to settle the tie. In the build-up to the tie, Manager Darrell Clarke made just the one change from the side that started last weekend’s SkyBet League One fixture against MK Dons. The change saw Joe Partington return at right-back, as Daniel Leadbitter had to settle for a place on the bench. Ellis Harrison returned to the matchday squad, following his suspension last weekend, as Rovers had to options on the bench in the shape of Dom Telford and Byron Moore. Rovers created chances early on at Meadow Lane and almost test the Notts County in the opening minute. An intelligent turn from Rory Gaffney opened up the opportunity for a first-time shot, which the striker sent narrowly wide of the target. The bright-start from Rovers was rewarded with a goal in the seventh minute. A well-weighted delivery into the box from wide out right by Joe Partington, found Liam Sercombe in space inside the area, with the midfielder watching the ball to time a leap in the air to thunder home a header to put Rovers ahead. Is was another headed goal that extended Rovers’ lead four minutes later, as an inswinging corner from Chis Lines caught the visitors defence by surprise, leaving Stuart Sinclair free to head home unmarked for his second goal of the season. After a dominating display inside the opening twenty minutes, as the game approached the half-mark the games swung back in favour of the hosts. Ryan Yates was on hand to head home from a set-piece following a Carl Dickinson’s delivery into the box from a set-piece. It was the same combination of scorer and provider that punished Rovers just two minutes later. Yates was again able to meet a Dickinson’s delivery into the box from another set-piece and was to steer a header past Adam Smith, as Notts County completed a dramatic recovery from conceding two early goals. After the interval, Rovers created a chance to restore their lead, as a first-time pass from Liam Sercombe picked out Rory Gaffney in space. The striker drew in a number of Notts County defenders before launching a driven effort on goal that was pushed away by Fitzsimons, with the rebound narrowly missing the onrushing Tom Nichols. The hosts managed to go ahead for the first time in the tie just before the hour mark. After making progress down the left, Jorge Grant was able to break to the touchline before firing a pass across the face of goal the was prodded home from close-range from Jon Stead. Rovers introduced Ellis Harrison in search of scoring an equaliser and the striker was immediately involved, heading a cross back across goal to Rory Gaffney, who tested the ‘keeper with a forcefully struck shot. Deep in the six minutes of stoppage time, Notts County added a fourth, as Jorge Grant broke in behind the Rovers defensive line and held his nerve to place a side-footed finish out of the reach of Adam Smith. Notts County: Ross Fitzsimons (GK), Matt Tootle, Carl Dickinson, Elliot Hewitt, Richard Duffy (C), Shola Ameobi, Jorge Grant, Terry Hawkridge, Shaun Brisley, Ryan Yates, Jon Stead. Rovers: Adam Smith, Lee Brown, Tom Broadbent, Tom Lockyer (C), Joe Partington (68′ Daniel Leadbitter), Stuart Sinclair (60′ Ellis Harrison), Liam Sercombe, Chris Lines Ollie Clarke, Rory Gaffney, Tom Nichols (80′ Dom Telford). Substitutes: Sam Slocombe, Marc Bola, Byron Moore, Dom Telford, Daniel Leadbitter, Ellis Harrison, Ryan Sweeney.